This was a "kitchen-sink" compote. To my immense gratification, I finally put an almost-full bag of frozen blueberries to use, as well as some dark sweet cherries that had been languishing in the freezer even longer. The rhubarb I had bought with purpose, but only needed a pound of it for my crisp. I had a whole pound left and was thinking either chutney or a jammy compote. I didn't know what I would eat with a savory chutney, so I opted for the latter. A compote is defined as fruit stewed in a sugar syrup. That's sort of what I did. For me, this is what homemade jam looks like. I don't like it as sweet as traditional jam. Not even close. Since I am NOT preserving/canning or doing anything that requires exacting food safety standards, I'm free to use as much or as little sugar as I want. I put half the compote in the fridge and froze the rest. Since there is just over 1/3-cup of sugar in a batch that made over 2 cups of compote, I feel fine eating it with a spoon. All you do is put everything in a pot and simmer until it reaches the consistency you want (this is also how I make chutney, by the way). Rhubarb breaks down quickly, and here it melded beautifully with the frozen blueberries and cherries, leaving plenty of bright, tart flavor. I added rose water (another ingredient hanging aimlessly around the fridge! ), some fresh ginger that hadn't been earmarked for any special purpose, and cardamom for some intrigue, but you don't need to use any extra flavor elements if you don't want to. P.S. 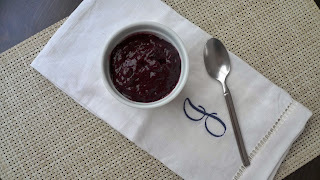 Here's my quick fig jam from last summer using the same method. I cannot wait to make this again. So, are you a huge improviser like me, or do you have a more measured jam-making method? Share your thoughts or recipes in the comments! You can always add more sugar for a sweeter compote. Combine all ingredients in a medium sauce pan and bring to a simmer. Simmer over medium heat, stirring frequently until fruit is broken down and compote thickens slightly (it should still be loose enough to easily run off a spoon), about 20 minutes (will continue to thicken slightly as it cools). Cool in sauce pan, then transfer to an airtight container. Keeps in refrigerator 1 to 2 weeks; freezes well. This looks wonderful! A few weeks ago I made (and canned) blueberry-rhubarb jam made with only blueberries, rhubarb, sugar, and pectin. I'm planning on entering it into the local fair because it tastes so wonderful. I'd love to try your recipe with even more goodness added to it. I discovered rhubarb for the first time this year (!) and have been obsessed with it since. Crisps, cakes, muffins. I think I will have to try compote too! Bookmarking this to try soon.